Hitachi Z-HD5000 cameras capture Binghamton Bearcats basketball action. Photo credit: Jonathan Cohen. New York’s Binghamton University begins live stream broadcasting of NCAA Division I basketball games over ESPN3 with four Z-HD5000 cameras from Hitachi Kokusai Electric. 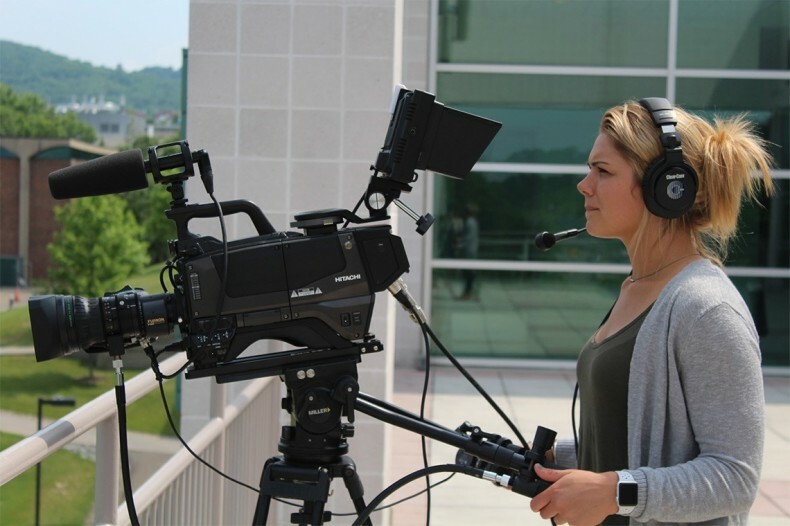 Binghamton University Athletics Communications Assistant Sydney Harbaugh operates one of the university’s four Hitachi Z-HD5000 cameras. Photo credit: Binghamton Athletics. When the athletics department at New York’s Binghamton University seized the opportunity to stream 30 of its men’s and women’s NCAA Division I basketball games over ESPN3 — the online streaming service of sports network ESPN. The university deployed four Hitachi Kokusai Z-HD5000 cameras to provide the high-quality video acquisition required by the network. Formally known as the State University of New York at Binghamton, the school is ranked among the elite public universities in the country, and offers students a broad, interdisciplinary education with an international perspective.The university’s Binghamton Bearcats teams compete across a wide range of sports in the National Collegiate Athletic Association's (NCAA)’ America East Conference. Two of the Z-HD5000s are deployed on tripods in high-center positions at the university's Events Center, providing a wide ‘game shot’ and a tight ‘hero shot’. The other two cameras are used in shoulder-mount ENG configurations on the arena floor, most commonly with one below each basket. In addition to ESPN3, live streams of the games are also available on the America East Conference website for international viewers – an important audience given that the university’s teams include players from all over the world. The live feed and replays are also displayed on the arena’s 14 foot wide video board, enhancing the in-venue fan experience, while archived footage and highlights are distributed to coaches, the conference office, and the school’s social media channels. The two fixed-position cameras are equipped with VF-701HD 7” color LCD studio viewfinders and mounted on Miller tripods, while the roving units are paired with VF-402 black-and-white ENG viewfinders. All four cameras are outfitted with Fujifilm Fujinon XA20sx8.5 BERM lenses with 2x zoom extenders, and are linked to TU-HD1000 camera control units (CCUs) and RU-1000VR remote panels in the facility’s control room. Building upon the success of their basketball streams, Binghamton University plans to expand their streaming coverage in the fall to include soccer matches originating from the Bearcats Sports Complex, as well as wrestling.